The community has been discussing the Mtn bike crash during the Redmond Derby Days last weekened in our Flickr photostream and on Facebook. Amara from Wheels in Focus shot this photo. 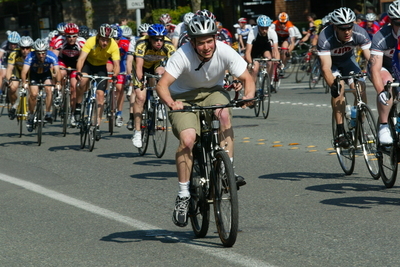 At Redmond Derby Days crit in the Cat 4 field, a racer started on a Huffy MTB. He was dropped and lapped. Part of the field formed a “v’” around him. When they came back together, there was a large crash. Chris Boyles was seriously injured in the crash with 3 broken ribs and a punctured lung. We shot this photo of a bike that was involved in the crash. 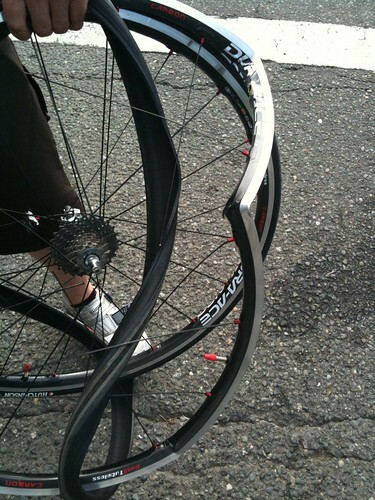 The wheels were destroyed and the frame was cracked. we’ve got a racer in hospital and I expect people worrying and talking about this incident behind the scenes. We’re a small community. Our take is the newsworthiness of the story; we saw it happen, and relayed what we heard at the time. We wish Chris a speedy recovery and hope an incident like this never happens again.